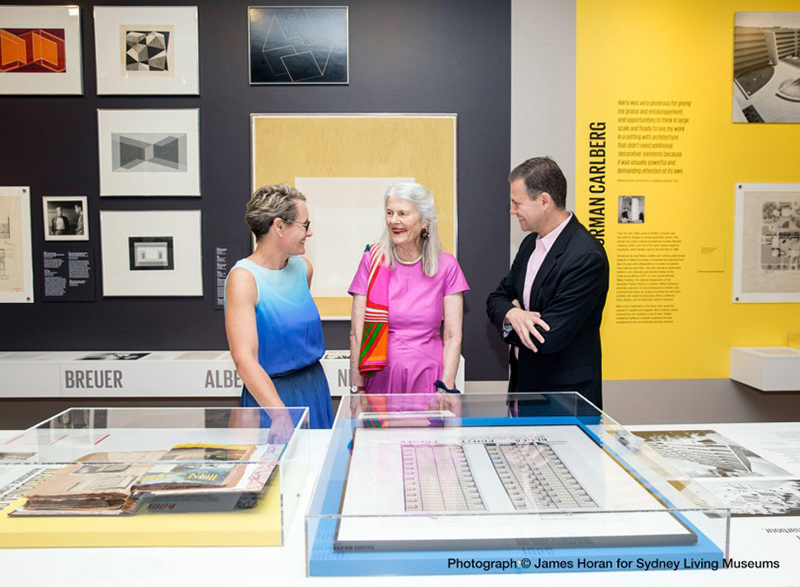 Just as Vladimir Belogolovsky recounts a few times in Harry Seidler: The Exhibition that he learned about architect Harry Seidler (1923-2006) in 2010 from Emilio Ambasz, I first became aware of Seidler at a precise time. Although I don't recall the exact year, I was working on a proposal for a residential tower while employed at an architecture firm in Chicago. Faced with the need to do something creative with balconies, I stumbled upon the high rises Seidler had designed in Sydney. His work was a powerful precedent, since it was simultaneously logical and sensual, repetitive and flowing. This is evident in such projects as Horizon Tower, a 43-story tower completed in Sydney in 1998. The same combination of logic and sensuality can be applied to Belogolovsky's take on Seidler. 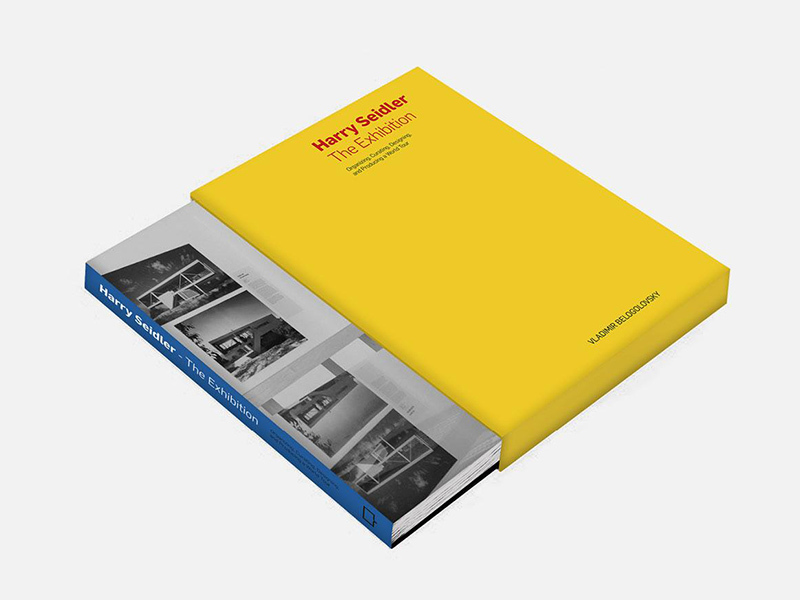 It's evident that the curator was immediately smitten with the architect's work, but his appreciation and documentation of Seidler's oeuvre – in the exhibition and the book documenting the same, as well as in the earlier monograph, Harry Seidler: LifeWork – is treated logically. For instance, he traces certain qualities of Seidler's architecture to a number of influences: "confidence, social purpose, and a methodological and collaborative approach to design from Walter Gropius; residential types, the power of concrete, and the warmth of wood from Marcel Breuer; standardized building systems and expressive structural language from Pier Luigi Nervi; sculptural fluidity and lyrical forms from Oscar Niemeyer; and a profound understanding of how our eyes react to visual phenomena from Josef Albers." This last influence is a particularly important one since it gets at Belogolovsky's overarching theme: that Seidler's architecture was most heavily influenced and indebted to art rather than architecture. The phrase "painting toward architecture" is not Belogolovsky's; he admits that it came from Henry-Russell Hitchcock's 1948 book of that name. In that book Hitchcock describes Theo van Doesburg's 1923 painting Space-time construction #3 as one of the most direct influences on modern architects, since the artist was "working consciously and directly toward architecture." Belogolovsky sees the painting's influence in the house Seidler designed for his parents in the late 1940s, when they managed to lure the Austrian-born architect from the United States, where he had gone to architecture school, to Australia, where his parents had just moved. (It's interesting to speculate what would have happened if his parents were not successful in bringing Harry to Australia, where he became, in Belogolovsky's words, "the first architect in Australia to fully express the principles of the Bauhaus in that country" and whose "architecture has become an integral part of the Australian identity.") The house resembles the work of Gropius, who he studied under at Harvard, but the incorporation of a colorful mural signals something in Seidler wanting to break free from the rectilinear confines of Bauhaus architecture. In Belogolovsky's hands, the influence of colorful, abstract art is most overt in the design of the traveling exhibition and the book documenting it. The slipcase of the latter, for instance, is simply yellow with red lettering, while the binding is blue, and the end papers echo these three colors. 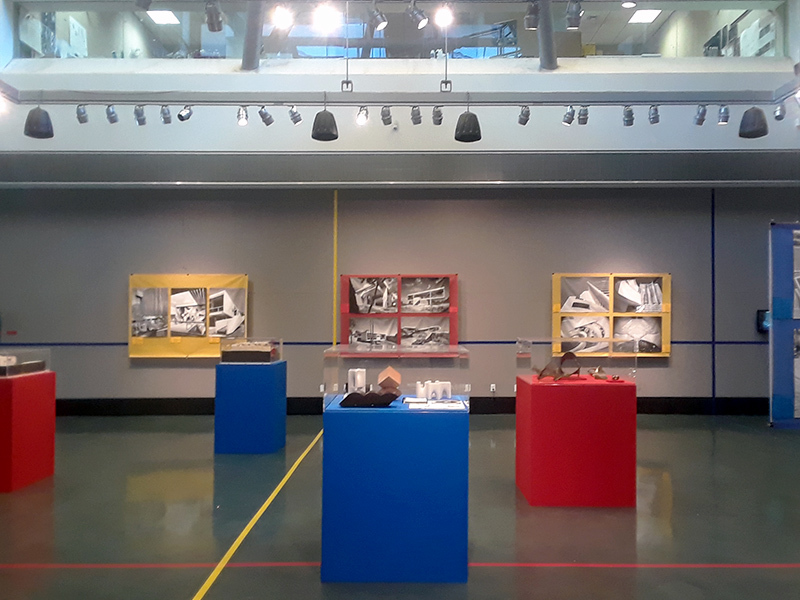 The palette of yellow, red and blue permeates the design of the exhibition, here visible at City College, where it on display until the day before Thanksgiving. The colors cover the bases for the models and the hanging canvases for the black-and-white photographs, and they make up the lines on the floor and walls that break the exhibition down into smaller zones. 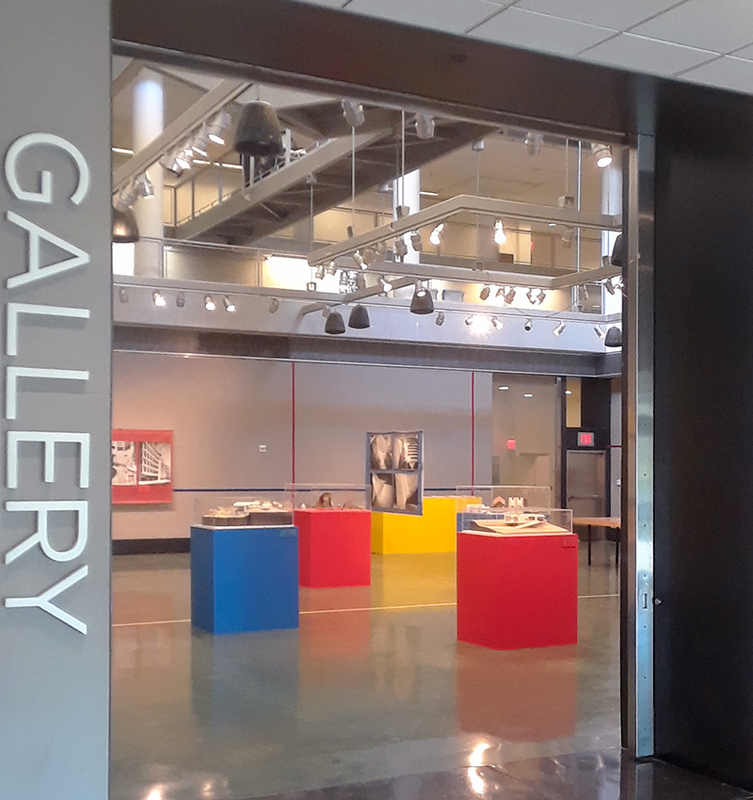 Stepping into the CCNY exhibition space, although a bit too large and spread out compared to earlier venues, is to step into the realm of Seidler and his artistic influences. Belogolovsky met Seidler's wife, Penelope Seidler, not long after Emilio Ambasz informed him about the architect. He proposed to her a modest exhibition in the lobby of one of Seidler's Sydney buildings, but she countered with the proposal for a world tour, a daunting prospect that only the most punishing curator would immediately agree to, I'm guessing. Whatever the case, that meeting launched what would become an exhibition traveling to more than 20 cities on 5 continents. One would think Painting Toward Architecture would have started in Sydney, home to many of Seidler's buildings, but instead it opened in Estonia in October 2012 and would not reach Sydney until stop #12 in November 2014. 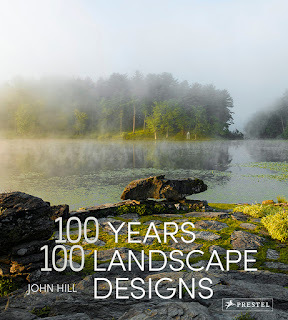 While this may seem counterintuitive, it gets at the heart of what makes a traveling exhibition so special: it introduces a subject (Seidler) to an audience not very familiar with it (most people outside of Australia). With the LifeWork monograph published in 2014, Belogolovsky's next book on Seidler – a logical undertaking given the amount of time and effort the curator has expended on the subject – needed a different format. Harry Seidler: The Exhibition presents Painting Toward Architecture as an important subject in its own right. Although he contends that the book is "not about its subject, Australian Modernist architect Harry Seidler," Belogolovsky's book does inform readers about the architect's life and work very well. He does this through a transcript of one of the many lectures he's given on Seidler, timelines of his life and buildings, selected quotes, and essays on various aspects of Seidler's life. 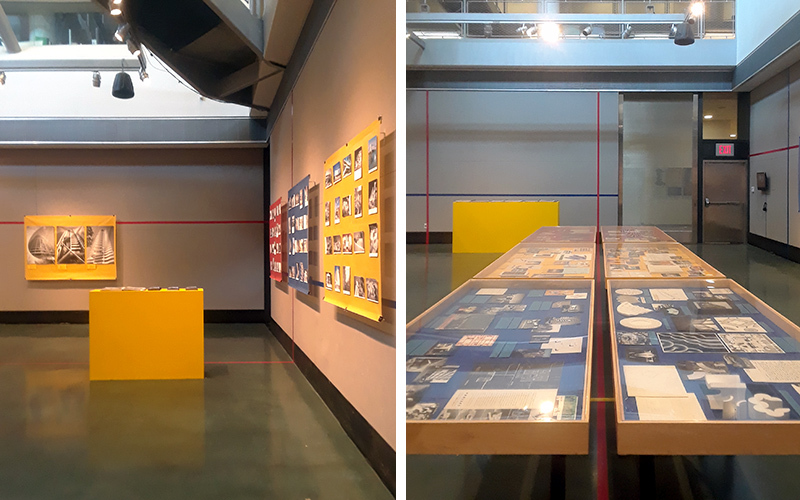 These materials are in the minority relative to the documentation of the exhibition, but they work together in a way that learning about the architect is a byproduct of learning about the exhibition. 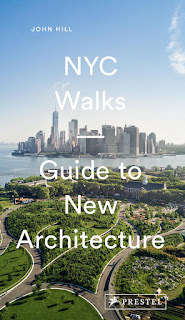 Of course, the book only goes so far in conveying what's inside the exhibition; so those in and around New York City are urged to head to City College before this leg of the traveling exhibition closes on November 22nd. Where it goes from there, I just don't know.